Please see the previous article at http://ponnadi.blogspot.in/2013/12/virodhi-pariharangal-7.html. gathi generally means walking (based on gamanam - going), the way (like in archirAdhi gathi - the bright path to paramapadham) and the refuge/target (like in agathi - the one who does not have any refuge). Here the main points discussed relate to how to conduct oneself with srIvaishNavas (one who have taken shelter of bhagavAn through an AchArya), samsAris (materially minded people), etc. We have previously discussed the definition of srIvaishNava, mumukshu, samsAri, etc - that can be recollected as necessary. Stepping on the bed that was used by srIvaishNavas is an obstacle. Translator's note: Whatever used by srIvaishNavas they should be treated as holy and respected. In our tradition, stepping on anything is considered to be offensive. While it is quite normal in other cultures to keep the feet up, push/pull things using the feet, etc., it is considered as a great disrespect to touch any one or any thing with ones feet in our culture. It is disrespectful to avoid srIvaishNavas who are coming towards us. One should humbly offer them praNAmams and proceed submissively. Translator's note: It is highlighted in sAsthram that when a vaishNava meets another vaishNava, mutual respects must be paid by offering full praNAmams (prostration) - but these habits are fast disappearing nowadays. In contrary to the previous point, it is an obstacle to be very humble towards samsAris. Translator's note: It is explained by our pUrvAchAryas that with samsAris will increase our attachment towards wordly pleasures - so being very humble towards them looking for material favours will be detrimental for our spiritual progress. While having the vision of gOpurams, vimAnams of bhagavAn's temples, one should worship them and relish the beauty of them. Ignoring them or quickly crossing them is an obstacle. Translator's note: In periya thirumozhi 2.6.6 pAsura vyAyAnam, periyavAchAn piLLai highlights an incident where nanjIyar says that he observed piLLai thirunaRaiyUr arayar and bhattar used to perform pradhakshiNam (circumambulation) of the temple greatly admiring and relishing the temple gOpurams, residences of the srIvaishNavas, etc. While having the vision of gOpurams, vimAnams of dhEvathAntharam (other dhEvathas) temples, a srIvaishNava should quickly pass the area instead of worshipping them or relishing their physical appearance. Doing so is an obstacle. Translator's note: In this connection an incident is identified by nampiLLai in his eedu vyAykAnam for thiruvAimozhi 4.6.6 pAsuram. piLLai uRangAvilli dhAsar's nephews vaNdar and choNdar were once walking along with agaLanga nAttAzhwAn. Wanting to tease them, agaLanga nAttAzhwAn shows a jain temple and tells them it is emperumAn's temple and asks to offer their obeisances. They duly follow his request but once they realize that it is not emperumAn's temple, they faint at once. Hearing this, piLLai uRangAvilli dhAsar arrives there and gives them the dust of his lotus feet and after applying that they gain consciousness. Such is their firm faith. Seeing emperumAn's temple one should go around it in clock-wise manner as a pradhakshiNam - going in the opposite direction is an obstacle. While going some where, if we hear bhAgavathas reciting dhivya prabhandham, etc., we should wait, listen to the same and slowly leave the place. Walking off very fast at that stage is not proper. On hearing other matters being discussed or glorified, one should leave the place quickly closing the ears. While walking along with AchAryan or srIvaishNavas, one should not step on their shadows. We should also walk so that our shadow does not fall on them. Also, one should avoid the shadow of samsAris touching us and our shadow touching samsAris. When going for collecting materials for bhagavath/bhAgavatha ArAdhanam (worshipping), one should not walk close to the residences of brahmA, rudhran, etc. sANdilya smruthi explains that the residences of them are similar to smasAnam (crematorium). Stepping on materials that were used in worshipping dhEvathAntharams is considered as Asoucham (contamination) and should not be done. One should not walk in the company of pAshaNdis (avaishNavas or the ones who try to negate the glories of bhagavAn). One should show gratitude to the srIvaishNavas who accompany him/her during travels. Ignoring them is an obstacle. While sending-off srIvaishNavas, one should go upto a good distance and wait for them to disappear from the vision. Sending them off right at our door-step is not proper. Translator's note: It is explained by elders that one would go up to a water-body (river, lake, etc) which is usually located at the entrance of the town while sending off srIvaishNavas. When AchArya or srIvaishNavas come towards us, we should go towards them and welcome them. Just sitting wherever we are without welcoming them is not proper attitude. When dealing with samsAris it is unnecessary to be overly caring while welcoming them or sending them off. Looking for monetary benefits one should not go to the homes of samsAris. dhivya dhEsams are known as "uganthu aruLina nilangaL" (உகந்து அருளின நிலங்கள்) - bhagavAn descended here with great compassion - these are the temples which were highlighted/glorified by AzhwArs. 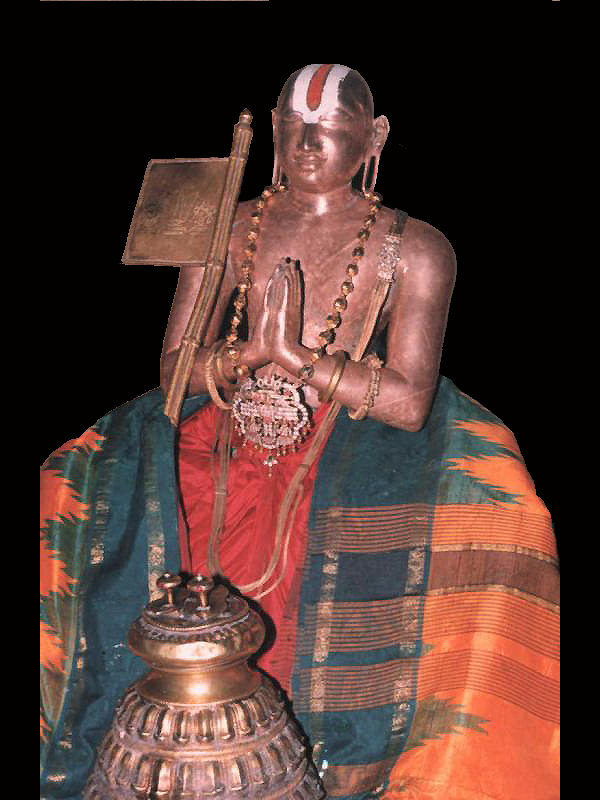 AchAryas also had special attachment towards certain kshEthrams - these are called abhimAna sthalams (srI rAmAnuja had great affiliation towards thirunArAyaNapuram, mAmunigaL had great affiliation towards rAja mannAr kOil, etc). When one goes to such places, they should spend time in worshipping and glorifying bhagavAn. Just roaming around in those kshEthrams is not proper attitude. Translator's note: The whole purpose of thIrtha yAthrais (sacred pilgrimages) are to go and worship emperumAn and to meet great srIvaishNavas to get their association. Going to functions/festivals of bodily relatives just based on the bodily platform. Skipping/Avoiding functions/festivals of Athma bandhus - srIvaishNavas who are fully dedicated to kainkaryam. emperumAn is staying as antharyAmi (in-dwelling soul) with in every one. So, one should avoid unnecessarily walk rashly and disturb the antharyAmi emperumAn. One should be soft in their walks so that it does not disturb anyone. Translator's note: It is said in prahlAdhAzhwAn's charithram that when he was pushed down from the mountain top and when he started falling down, he at once held his heart tight so that there is no jerk for the emperumAn who is in his heart. That should be our attitude too. One should constantly go behind sadhAchAryan (true AchAryan - could either be the one who performs pancha samskAram or the one who instructs valuable knowledge in bhagavath vishayam) and serve him properly. mAmunigaL explains these principles beautifully in upadhEsa rathina mAlai 64, 65 and 66 pAsurams. Please read them and be clarified. Translator's note: In the 64th pAsuram, mAmunigaL explains that a sishya should constantly serve his/her AchArya when the AchArya is in this world and asks how one can be missing out on that. In the 65th pAsuram mAmunigaL explains that the AchArya's responsibility is to take care of the sishya (jIvAthmA/soul) and the sishya's responsibility is to take care of the bodily needs of AchArya and says that it is very difficult to fully understand and implement this principle. In the 66th pAsuram, mAmunigaL highlights that pinbhazhagiya perumAL jIyar was such an exalted sishya of nampiLLai where jIyar was constantly engaged in serving nampiLLai and even shunned paramapadham to continue his service for nampiLLai and instructs his heart to sincerely follow such attitude. One should not go behind others for any material gains other than bhagavath/bhAgavatha kainkaryam. One should be fully at the disposal of sadhAchAryan (true AchAryan) - when the AchAryan says "go" the sishya should go and when he says "come" the sishya should come - there should be no questioning/protesting - one should simply follow the true AchAryan. In dhivya prabhandha gOshti (congregational recital) during processions, one should not try to go in the front of the gOshti - one should always be humble and stay in the back. One should not hesitate to the stay and walk in the back lines. One should help others who are unable to walk fast during such gOshti. Ignoring such persons needing help is an obstacle. When one gives the AchAryan a helping-hand, one should be respectful and affectionate. One should not do this casually. sthithi means existence and also sitting. This topic explains how one should behave in different situations. samsAri means one who does not know about their own true nature (i.e., as servitor of bhagavAn and bhAgavathas). They are mainly focussed on nice food, clothing, etc. Let us continue with the obstacles discussed in this topic. Being touched with the clothes worn by samsAris. Translator's note: We have already discussed the incident from bhattar's life where a dhEvathAnthara devotee's cloth touches bhattar and he atones for that by accepting the srIpAdha thIrtham of a bhAgavatha. Being seated in the same seat or a similar seat to a samsAri. Allowing our clothes to touch srIvaishNavas. Translator's note: One should be careful in close proximity of srIvaishNavas and not touch them. They may be in the middle of some kainkaryam for emperumAn, AchAryan, bhAgavathas. We may be unclean at times - so we should avoid touching srIvaishNavas and contaminating their sanctity. Considering ourselves as equal to other srIvaishNavas and being seated on an equal seating with srIvaishNavas. Translator's note: In srIvachana bhUshaNa dhivya sAsthram, the main apachAram identified by piLLai lOkAchAryar is to consider oneself equal to another srIvaishNava. One should always be humble and consider oneself to be lower than other srIvaishNavas. One should not consider samsAris to be higher than oneself and be seated at a lower platform than them. Translator's note: samsAris means one who increase our bodily attachments in many different ways. One should be very careful in to having admiration of samsAris in whatever ways and consider oneself subordinate to them. That will eventually increase ones own material aspirations and keep oneself in the vicious cycle of birth and death in this samsAram. One should not live in the same house where samsAris live. One should not wait anxiously for the arrival of samsAris with the intent that we will gain material benefits by their arrival. One should not be in the company of samsAris. One should not live in a place which is filled with samsAris. Refusing to be seated at a lower platform to srIvaishNavas. Translator's note: One should happily sit at a lower platform compared to srIvaishNavas. Hesitating to live in the same house where srIvaishNavas live. Feeling ashamed to wait anxiously for the arrival of srIvaishNavas. Not willing to be in the company of srIvaishNavas. Not living in a place which is filled with srIvaishNavas. Being inside the house when AchAryan or emperumAn is on a procession and is outside ones own house. Translator's note: In dhivya dhEsams, etc., it is often seen that emperumAn goes on a procession in the streets around the temple. It is by the great compassion of bhagavAn that he comes out of the temple to give his mercy to every one (even the ones who are old, suffering from diseases, disability, etc., and cannot visit the temple). When emperumAn comes out on procession, one should step out of their house before his arrival, wait for his arrival and welcome him appropriately according to local customs (offering flowers, fruits, etc). While seeing AchAryan and srIvaishNavas, one should immediately rise, offer our respects and welcome them. Not doing that is an obstacle. In contrast, when samsAris visit, even if they are materially well-off one should consider them as a blade of grass (which is not worthy) and avoid giving them a great welcome (looking for material benefits). Translator's note: One can recollect "yOnithyam achyutha ..." thanian for emperumAnAr where it is said that emperumAnAr treated everything but the lotus feet of emperumAn as a blade of grass. Being casual about the arrival of AchAryan and srIvaishNavas. Translator's note: One should become excited about the arrival of srIvaishNavas and ensure that they are well taken care off. While doing thiruvArAdhanam for emperumAn, if a srIvaishNava arrives, one should stop the thiruvArAdhanam at once, welcome the srIvaishNava, enquire his well-being, make some arrangements for his comfortable stay and resume the thiruvArAdhanam. One cannot simply make the srIvaishNava wait citing that he is in thiruvArAdhanam. It is to be understood that bhAgavatha ArAdhanam is more important than bhagavath ArAdhanam. When collecting/accepting srIpAdha thIrtham from one srIvaishNava and another srIvaishNava arrives at that time, it is improper to stop collecting srIpAdha thIrtham from the first srIvaishNava. One should request for pardon from the newly arrived srIvaishNava, humbly ask him to wait for some time, complete the srIpAdha thIrtham procedure with the first srIvaishNava and then proceed to do the same from the second srIvaishNava. The srIvaishNavas who are giving their srIpAdha thIrtham should also co-operate properly and should not leave abruptly. jangama vimAnam means movable object - refers to both vAhanams that are seen during uthsavams and srIvaishNavas (who carry emperumAn in their hearts). ajangama vimAnam means immovable object - temple tower. One should not step over the shadow of both movable and immovable vimAnams. One should not stand such that the shadow of the temples and the temple towers of dhEvathAntharams fall on them. One should not stand in the shade of trees that are dear to dhEvathAntharams (for example neem tree). It is ideal to be in the shade of trees such as tamarind tree which is dear to nammAzhwAr. One should not stay in the places that are deemed to owned by dhEvathAntharams and that are dear to dhEvathAntharams. Ignoring bhAgavathas homes and staying in abhAgavathas (one who is not devoted to srIman nArAyaNan exclusively) homes is an improper action. It is best to avoid staying in abhAgavathas' residences. Translator's note: A well-known incident from mahAbhAratham could be studied to understand this principle. When kaNNan emperumAn went to dhuryOdhana as a messenger, he ignored the palaces of dhuryOdhana, bhIshma and dhrONAchArya and went to vidhura's palace. vidhura, being a great devotee of emperumAn, greatly relished emperumAn's arrival. When dhuryOdhana asks kaNNan emperumAn why he ignored their palaces, emperumAn answers "Because pANdavas are very dear to me, I cannot visit ones who are not favourable towards them" - emperumAn himself chooses to stay with bhAgavathas only clearly demonstrating this principle. When the AchAryan is standing, the sishya should not be seated. When the AchAryan is walking, the sishya should not be seated. He should walk along with the AchArya and assist him as necessary. When AchAryan instructs the sishya to stand, disobeying that is improper attitude. Stretching ones feet towards the direction of bhagavAn, bhAgavathas and AchAryan. This is not proper at all. Even in temples, when srIvaishNavas arrive, one should rise and respect them. It is improper to stay seated even after seeing srIvaishNavas enter the temples. In the presence of bhagavAn and bhAgavathas (at temples, etc), one should not close their eyes and sit in meditation. One should be fully awake and relish the beauty of emperumAn, divine assembly of emperumAn and the presence of wonderful bhAgavathas. There is an incident identified in bhattar's life where bhattar notices some one praying with closed eyes in front of emperumAn and bhattar feels sorry for him and tells him that he is missing out on wonderful dharshan of emperumAn by shutting his eyes. It is also said that subsequently that person lost his eyesight.